Some many years ago British Airways offered me a trip to Shropshire that was labeled as literary. I ended up going to Byron's Newstead Abbey and went to 8a Victoria Street, Eastwood, Nottingham, where D.H. Lawrence was born. I visited Much Wenlock a town where novelist/poet Mary Gladys Webb (1881-1927) lived for some years. Most of her delightful books are about the Shropshire she loved. 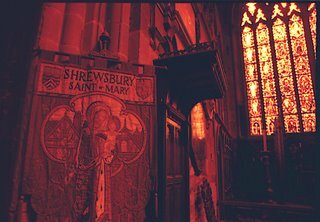 But it was in Shrewsbury where I had special fun. 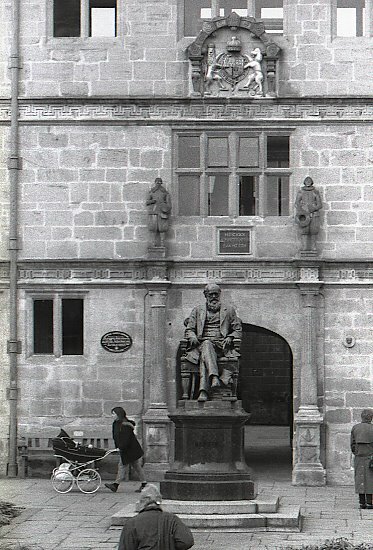 The paradox of this city for me was that Charles Darwin, its favourite son, had almost no presence while Ellis Peters's circa AD 1140 detective monk, Brother Cadfael, seemed to ooze out of every stone I saw and photographed. This was specially so at the Abbey of St. Peter & St. Paul. It was almost anochronistic to find a rack of Brother Cadfael paperbacks for sale inside the church! 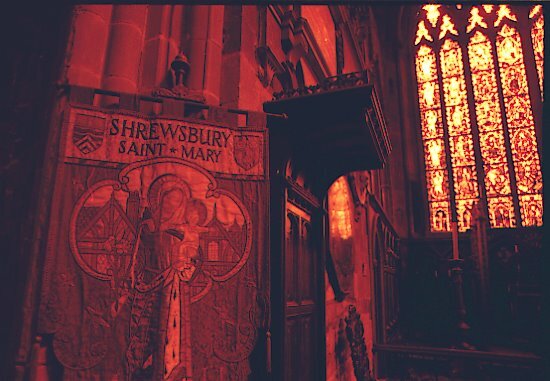 Shrewsbury is famous for its medieval (begun in the 12th century) church of St. Mary the Virgin. The church has beautiful stained glass windows from the 14th to the 19th century. I asked a taxi driver how he pronounced the name of his town. He was colourful in his answer, "Those with their nose up in the air make it rhyme with show . We taxi drivers rhyme it with the little nasty rodent." I tried to find one Aconitum (Monkshood) growing in the lovely church gardens. This extremely deadly plant is central to the murder in Monkshood. A Welshman and a crusader in the First Crusade, Brother Cadfael knew his poisons since he was also an apothecary. But there were no specimens (it usually has intensly blue flowers) to be found anywhere. Luckily Rosemary loves this plant. We grow it in the back of the borders and I have told Rebecca to be careful. 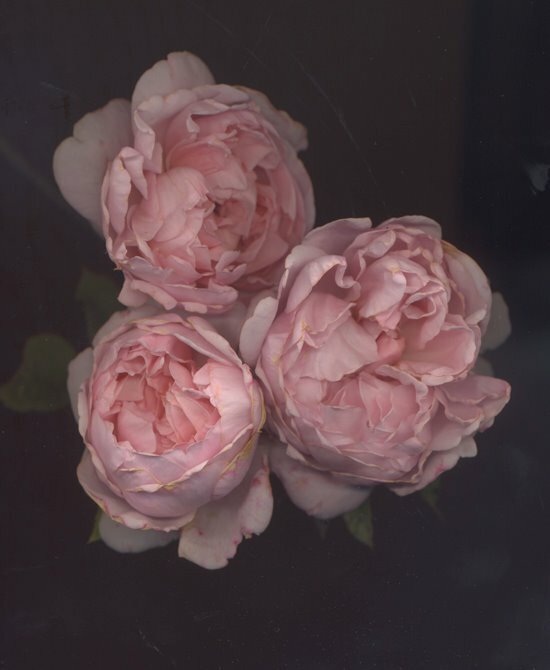 I was not interested in roses at the time so I chose not to visit David Austin's Shropshire nursery. I have made up for lost time. I now have at least 20 of his English Roses in my garden. Rosa 'Mary Webb'is stingy in repeat blooming but the near white (they remind me of whipped cream) flowers are huge and have the strongest myrrh scent of all of Austin's roses. I also have two extremely shade tolerant roses (a unique virtue in very few roses), Rosa 'Shropshire Lad' and Rosa 'Shropshire Lass'. A month ago I discovered Rosa 'Brother Cadfael'(above left). It was too late in the season to plant in the ground (I will do this in the fall) so I left him in the original plastic pot. Last night I scanned three of the fruity scented blooms. Mr. David Austin, when are you going to remember your favourite son, Charles?